I watched this a few days ago. I love arduinos. We use them in industrial control equipment as a replacement for ladder logic PLCs. However this video, while nice in that it gave an overview of the arduino’s upbringing – gave a lay audience absolutely NOTHING useful. It doesn’t show off what the arduino can really do – how easy it is to use – how accessible it really is, etc. If you want to get people interested in using arduinos (and we should) then you need to show them how easy and inexpensively and accessible this makes electronics. Knowing the history of it and where it came from is nice but really not relevant to a new user who honestly, doesn’t really care. They care about what it can do for them. Period. Who said the documentary was for new people wanting to know what the arduino is? The purpose seemed to be more for the people that already use the arduino and would like to know how it got to what it is today. I think the subtext of @CutThroughStuffGuy’s comment is that a documentary that introduced the Arduino to the uninitiated would have been far more valuable. Documentarys don’t have to be useful – they are for telling a story about something. 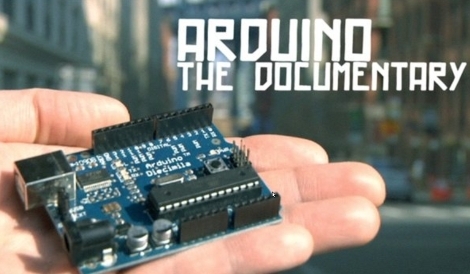 How could is this documentary less valuable than introducing someone to the arduino? People take things for granted and i love how people can see what effort went into it, and what sacrifice the arduino took to get this hardware/software out into the public as open source. I’ll just come out and say it. I love Arduino. It got me re-interested in electronics and programming. If it wasn’t for Arduino, I don’t think I’d be going back to school for CE. I’d probably still be working at a transfer agent, getting yelled at by stock brokers and causing $20,000 losses because I fat-keyed a number. Arduino really might have changed my life! Maybe another uC could have also done the trick, but nothing else seemed as exciting or noob-friendly. I can’t say I use Arduino very often anymore. Still, I can’t imagine a better beginner tool with a better community. It was interesting to find out, in some small sense, how the arduino came to be. That said, it didn’t get me any more interested in the thing itself. I’m just beginning and for now (due to cost), I’ll stick with my msp430s. Also, I don’t get the point of a <30 min documentary that doesn't really have much to say. I feel like i just wasted my lunch break. Don’t get me wrong. I ABSOLUTELY love the Arduino. They have made our lives markedly improved and saved us a ton of headache, money and hassle. I have personally bought dozens of 2056 Megas and Unos. They power very large, five figure machines that we design and build in house. That is more or less what I was trying to say. While knowing the backstory is fantastic and I applaud the efforts of the filmmakers, if Arduino is going to spread as well and as quickly as I and many others hope it will, then it needs to be “sold” on what it can do – the features and benefits and ease of use (which can still use a bit of work although once you know it – you can get into it very quickly but there is still a significant “new user hurdle” factor still at play when it comes to basic usage instructions). That, to me, would be more useful to learning about the Arduino than this documentary was. I watched it and was like.. ok that’s kind of neat but I already know the backstory and I am already sold on the idea of using Arduinos. But to a novice outside of electronics – they would watch that and most likely be like ok well what can it *DO* exactly? Why should I consider using this? What can it do *FOR ME*? The documentary, in my opinion, didn’t really speak to that at all. Which may have been the point and if so then somebody should make an adverdocumentary on the Arduino that is targeted at new users such that after watching it they go “HOLY CRAP! !” microelectronics can actually DO this stuff? And it only costs $30 – $50 to get started? I want to try this! It’s actually a documentary on open source stuff taking the arduino as a prime example. Why is it everywhere?? It’s pop-electronics galore. LED flashing and button pressing to the extreme. Even for someone with primitive knowledge will be able to solder an AVR prototyping board on a perfboard in no time and will make the STK200 for it it will have exactly the same function. But people somehow order the Arduino instead… I do recognize the potential of it, but this is getting bigger than really needed. “It’s not the hardware, it’s the software behind it, it’s open source and it’s great, let’s develop together!! !” you’ll say. I don’t really follow here… How easier can AVR development get than it was before the Arduino? I began my journey in the electronics world with microcontrollers and programming AVRs was pretty easy having a decent C compiler. How’s fitting virtual tables on 1KB of RAM going to change the situation, tell me? I personally like the device, although I’ve never used it. There are some cool projects with it, althought it’s mostly over engineering. There, I said it, kill me. When you outgrow the duinos and start programming pics directly, you suddenly can do more.. I love the 8 pin pics, really cool little devices to make sinister thing’s with…. Like the clock that changes speeds… a 8 pin pic can do that for 1/90th the price of the duino based one AND you can make it hidden in the clock assembly instead of having that big expensive Brick hanging off it. they are the essence of a gateway drug. too easy to access and use. and everybody has to try it. I will put some light since this news is not complet. The oficial homepage of the Arduino The Documentary is : arduinothedocumentary.org and since I am who had the idea of shootin it. We wanted people to put face to arduino team. Know a bit how it evolved by the people involved telling it. Please add the homepage so people can download the dvd when it gets relased and both versions in spanish and english in HD and now just the vimeo versions. @Arduino haters: The arduino a nice piece of tech for people to learn a bit and build something quick. @Arduino lovers: The arduino is like a bicycle with training wheels. Don’t forget to take off those training wheels at some point. Some guy I work with tried to use the arduino in some prototype we build. And while the AVR chips are more then fast enough for what we where building he couldn’t get it to work. I took a quick look at his code and I knew why. The arduino library is bloated. VERY bloated. I rewrote the whole thing in plain C accessing registers directly, and the code ran 4x as fast. Used 3x less flash and a bit less ram. The arduino software allowed us to start, but it doesn’t provide any ‘upgrade’ or ‘advance’ path. While I have no fear of datasheets and schematics, it proved to be just a bit to difficult for my colleague. Being a person who’s been wanting to get into electronics and programming, I see the arduino as a “gateway” drug. I haven’t tried using it yet, but because of the versatility and ease of use it tickles my fancy. I have no idea how to program pics, etc. Hell, half the stuff I read on HaD is confusing to me, but I’m still interested in reading about everything, and I do. Why is starting off using an arduino so BAD? People on here have told me to go and buy a pic programmer and just mess around with it, but how is that any different from using an arduino? I’m still learning? Eventually I’ll learn the intricacies of different microchips to suit my needs in terms of ram/power mumbojumbo, but for now isn’t the goal to get me into the scene in the first place? This debate is just as pathetic as the debate over which is a better OS between windows, mac, and linux. The best OS for your computer is the one that does what you need it to do the most efficiently. It’s the same argument, I personally like Arduino, I’ve been able to use it to do anything I’ve applied it to, and based on my programming skill level, it does exactly what I need economically. Currently I’m using an Arduino to replace a system that has always been controlled using relay logic. I also have to be able to explain to the 60 year old guy that’s always been maintaining this system how it works now, since this guy has never used a computer in his life, how would it have been better or easier if I used a PIC or anything else with a lower-level language than Wiring? I am a Computer Scientist, and I love the Arduino. I Guess it was developed for people whom are not that advanced with hardware. And coding for this little puppy is a breeze, its really simplified. I recently got the mega for my dad, he is a electronics engineer (graduated back in the 70s) so he can tech himself some of this new modern electronics, its an ongoing process. Arduino is for breaking the ice on microcontroller programing, then when the fear of using these little things is gone one can use other ATMEL chips and build his own PCB’s for specific applications or trying to use other type of microcontrollers or maybe PSoC or DSP. PIC is the worst choice to beginning with microcontroller programming: humongous datasheets, erratas, if you change to another PIC model you will need read another humongous datasheet, etc. but this will make a man out of you and you’ll be awarded by a lot of learning and experience. I had more enjoyable time learning PICs, perhaps I was lucky getting right book and tool(ICD). This just not true. You do need to look in data-sheet for specific hardware on yours PIC model but all other information is general to whole family. This is a documentary, not a commercial. War documentaries are not designed to get you interested in starting wars, so why is this different? Is there any advantage in using an Arduino instead of an AVR/PIC if you’ve already learned to use an AVR? That’s pretty awesome that you guys are using the arduino for industrial control. I’m currently studying ladder logic and PLCs. As I program PLCs in ladder logic, I often find myself longing for my old friend C. However, I find that using basic logic formations / instructions is forcing me to think about programming, and even the simple circuits that I may design day-to-day, in a different way. I feel that knowledge of basic logic is something that anyone interested in electronics, no matter what their goal, should have. I can’t tell you how many times I have used logic to accomplish something that I would have thrown a uC at in my early days! Because wars are not tangible, fungible entities that can be bought and sold and they certainly shouldn’t be encouraged. A good documentary should make you think, should inform you and should make you go – “I never thought about that or I never knew about that”. It should provide a call to action without being biased or skewing the facts. This documentary, while a superb documentary on the history of the arduino, for me, did not make me go holy crap I need to go buy one of these right now because look at what I can do with it. I am already part of the proverbial choir here but even if I wasn’t – the documentary was heavy on the history and light on the details and ways of using arduinos and how easy they are to use. Lots of times we buy used industrial equipment and the vendor simply will not provide ladder logic or compiled binaries for their PLC controls. So invariably when the PLC fails or is missing or the company is no longer in business or doesn’t support that model or even in some cases wants five figure license fees to use their hardware (even though the previous owner paid through the nose for the machine when it was new) – we turn to the Arduino and break down the functions necessity – the fail states, the normal functioning states, etc – throw in relay blocks and resistors if needed to get us to 24VDC or 120VAC or three phase 208 or 460 or whatever and run with it. The Arduino is fantastic at monitoring states, responding appropriately to inputs and outputs, is low cost, robust, easy to program, fast enough for our needs (although we tend to use Megas for the input/outputs without needing to mux), quick to start up from power on, able to monitor failure states with monitoring routines, has fast polling of inputs, and costs $50 or so. They are readily available and able to be integrated into commercial products. Not many people out there are controlling 480 volt 3 phase power using Arduinos and solid state relays but it speaks to the power of the platform and the flexibility that the Arduino brings to the table. I truly wish something like this was out there 10 years ago or so when I was trying to learn electronics. I never got past 555 timers. But with this, we can pick it up and make it reliably control industrial equipment just as well (if not better – the polling rate for things like rotary encoders is fantastic) than the original PLC in the unit. It’s not an approach for everybody (you have to be very deliberate with how you program and test it) but the results speak for themselves. Did I mention you can network them all together and enable extra outputs to “graft on” monitoring as well? Simply a superb little piece of hardware. ive been using arduino for a little more than a year and have greatly improved my electronics skills. these days i either completely ditch the board and use the chip in a board of my own design, though lately ive been using a nano with diy shields made from cheap radio shack proto boards. in many cases i kinda think that the hardware is overkill for the application. im somewhat interested in moving on to attinys at this point. lots of things i do just dont really require all the power and memory of an atmega328. also i kinda want to move on to lower level code. only thing really keeping me from taking the leap is a lack of cash flow at the moment. Hi, seem that you didn´t like the documentary, the way we shot it, is so you put a face to the people behind arduino, being the first opensource hardware board, you can try to find something fully opensource before, we hoped and 99% of people liked it. It a proyect that took a lot of effort to shot and cut. Its no two week kind of thing. The video documents history folks. Yea I know some hackers can’t be bothered with history. I can’t care less if that fault has them waste more time,and money than necessary. But it’s sad when their bullheadedness cause others to do the same.